MOLLY! MOLLY! MOLLY!!!! You have done it again!! You captivated me from the first page till the last page. 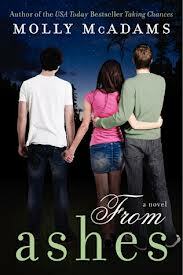 From Ashes is a love triangle between Cassidy, Tyler and Gage. From Ashes tells the story of a girl named, Cassi who has been mentally and physically abused daily by her mother and step father for 11 years, since the death of her father on her 6th birthday. Tyler is Cassidy's best friend, her rock, her doctor and ONLY family that she has. Cassidy confides in Tyler of the beatings and abuse and makes him promise not to tell a sole because she is afraid that they will take her away. Tyler vows to protect Cassidy and when Tyler leaves California to attend the University of Texas, he packs Cassidy's bags and takes her to live with him and his cousin, Gage. sure he lets him know that Cassidy is his and that he is in love with her. Cassidy loves Tyler as well, but not the same way that Tyler loves Cassidy. Tyler is her best friend, the only stability that she has had in her life. age and Cassidy hit it off immediately and for a year and a half Tyler was playing two ends against the middle between Cassidy and Gage in order to keep them apart. Little did Tyler know that his jealousy and arrogance would push Cassidy right into the arms of Gage and Gage was waiting with his arms wide open. Gage feels the need to protect Cassidy immediately and falls in love with her the moment he saw her. Some series of events occur that keeps Gage and Cassidy apart, but Gage vows to never stop loving her. Cassidy has some demons that she needs to fight in order to move from her past. Cassidy finds a new beginning "From Ashes" and will survive anything that God throws her way. Molly McAdams created AWESOME characters in From Ashes. I fell in LOVE with Cassidy and Gage and I was not ready for the book to end. From Ashes definitely pulled on the strings of my heart. I am glad that Molly didn't make me "ugly cry" as we all did while reading Taking Chances!!! Instead, I cried happy tears of joy!!!! I give FROM ASHES 10 stars and I would recommend this book to EVERYONE !!!!! !